Avoid the crowds at the Hermitage – you won’t be sorry! Upscale cafeteria with an open kitchen concept. Good Food – Reasonable prices. What’s not to love? View from the next to top level balcony – dramatic, awe-inspiring, amazing. I loved it. The Hermitage – aka the Winter Palace – is arguably the most famous museum in the world. For us – it was the raison d’etre of our trip to St. Petersburg – and seeing it was a huge priority. It turns out that this is true of almost every single visitor to St. Petersburg – and apparently all of them decided to visit the Hermitage on the same day we did. I’m not kidding about the crowd. I couldn’t even estimate the number of people that filled the room with the Peacock Clock – but I will tell you that I got scared. Both the IT and I are fairly short – by any standard – but in Russia we are considerably undersized. So in a crowd – it’s easy to lose sight of each other – and where we are going. I quickly lost sight of IT – and barely could spot MP – who is easily a head taller than us both! We made it across the room and decided – enough is enough. We are NOT going to continue following the crowd – we’ll visit ‘less visited’ sections – and circle back later in the day – audio guide in tow. Great idea. We headed down – away from the packed in tour groups – and slowly wandered our ways thru rooms filled with Roman and Greek antiquities. Not covered by the audio-guide – these rooms – clearly much less visited – had prepared explanations in most languages – full of interesting details and tons of facts. So neat. There’s a Diamond Room down here – available only by tour-guide, and only for an additional fee. We’re going to do this another day. The intriguing thing about the Hermitage – in addition to it’s outstanding collections, are the room decorations themselves. This was a sort of Palace for Catherine the Great – she came here to relax, and wanted the art that surrounded her to fit in to the room it was exhibited in. So there’s distinct Egyptian visual themes to the room with Egyptian antiquities, and she even had rooms copied from the Vatican made into walk ways and Galleries to display her German and Dutch works (Rubens was clearly a huge favorite of someone’s!). Glorious. Just Glorious. By about 2:00 pm the tour groups have seen it, done it, and left. We have the museum more to our own – although hardly empty, and we can now enjoy the sections we missed. Where before we had to peer over 30 heads to admire 1 of the 2 original Leonardo Da Vinci paintings, now we can contemplate them in piece and quiet. The cafeteria in the Hermitage is described in the guide book as dire – and I must say it lives down to it’s reputation. Memo to us – bring our own food tomorrow. Finally even we must admit defeat. There is still literally dozens of more rooms (maybe over 200) to see – but our feet aren’t willing to take it any more. We drag outselves out – and walk to the Fresh Market. This is another of those cafeteria type restaurants – I’ve never seen their like elsewhere – but they are hugely popular with the Russians judging by the number of Russian guests we see. You grab a tray – go to a station and order your meal. 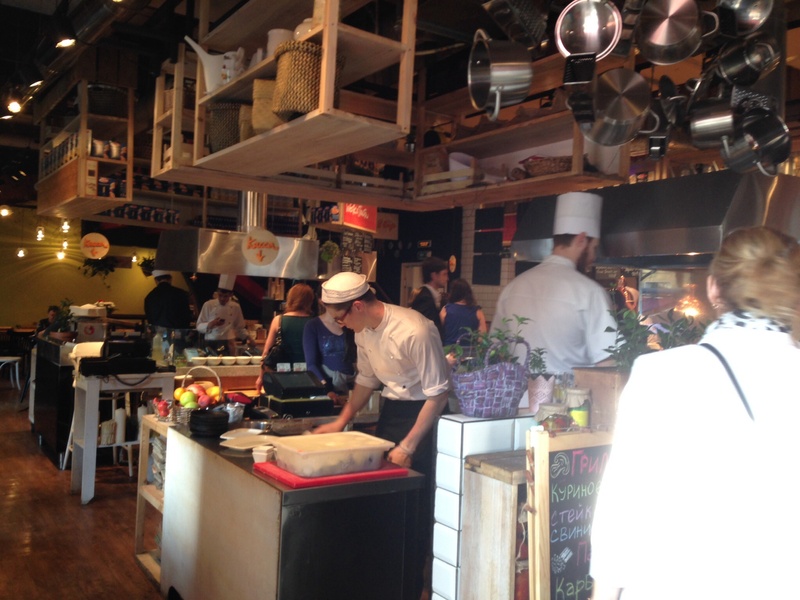 When it’s ready – sometimes within seconds – sometimes after a quick cook-off – you head for the cash. Upscale cafeteria with nice cutlery, real plates, and low prices. We order freshly made noodles with meat – and sit down outside to enjoy both the fresh air – and the view of Nevsky Prospect – the main shopping avenue of St. Petersburg. 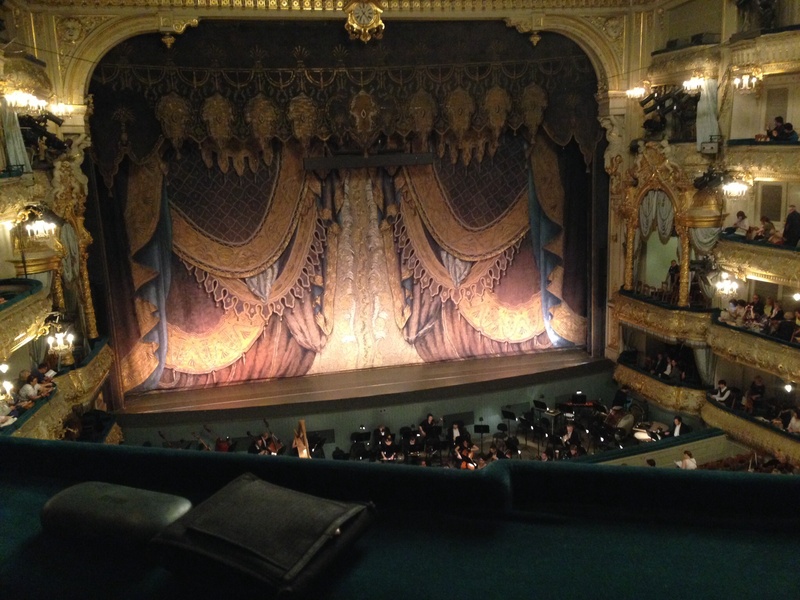 Now we must head back to the Theatre – this time we are in the ‘Old’ Mariinsky Theatre with it’s gilt and ornamentation. Like the new theatre, the sightlines are awesome, and while we’re in the upper decks – the stage is visually extremely close. The Ballet this time is not nearly as ‘classic’ as Sleeping Beauty – Called the Fountains of Bakhahisarai, it’s an interesting story about a Polish girl who is kidnapped by a Tartar the night of her wedding (Polish dancing, Love scene). He kills her entire family (lots of amazing sword fighting, sabor duels, and slashing with pikes), falls in love with her, and carries her off as a captive to his home. At home – (nice harum dancing to enjoy) – his top Concubine realizes she has been displaced – and manages to kill the interloper (stunning interplay between 2 incredibly talented primo ballerinas – then a great death scene). For this – she is put to death, and the Tartar mourns his lost loves (war dances to cheer him up fail to do the job). The staging is completely amazing. Real spouting water fountains, dozens and dozens of dancers filling the stage (at one point – we counted over 100), glorious music – very well played, and of course the dancing. Oh – the dancing. Not only are the soloist beyond reproach (is it possible to lift your leg that high? do that many spins when you are in the air? Leap that far? Carry that high? Fall forward onto your knees from an on-pointe position?) – but the ensembles are even more fun to watch. Even the lowest member of the ensemble would be considered amazing if they were to perform on our stage. No expense is spared on costuming – and from our vantage point the forming and re-forming of stars, loops, lines, etc. is wonderful to watch. Much applause – lines at the toilets and the cloakroom, then It’s a taxi home again tonight.